Editing existing or adding new records using the Custom Metadata Records Editor. You can open the Custom Metadata Records Editor from the Main Menu: Tools ⇒ Edit Custom Metadata Records. 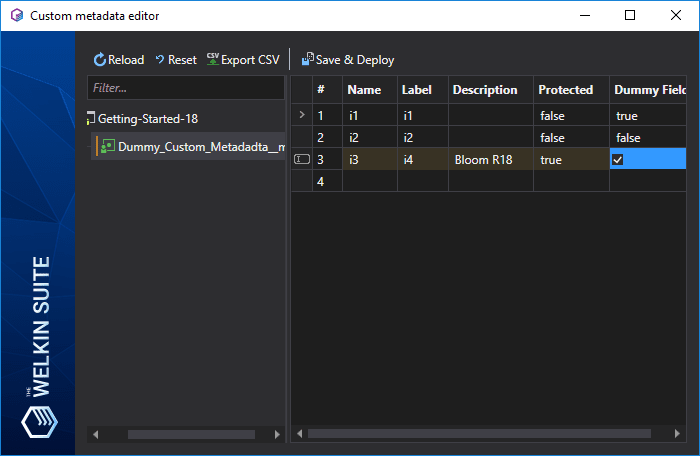 On the left side of the Custom Metadata Records Editor, you can see a list of projects in your solution with child items representing different Custom Metadata objects. Once you select any of them, on the right sight of the editor you will see a table with the records that are available locally in your project. You can edit any existing record by double-clicking on any field and changing the value there. To create a new Custom Metadata record, just double-click on any cell in an empty line below the list, fill in values, and it will be ready for deployment to Salesforce once you're done. Remove record — if you have added a new record to the table but have not yet deployed it, you can remove it with this option. All the changed cells will be highlighted with a different background. You will also see a change indicator in the list of Custom Metadata on the left side: if any record was changed or added for a certain Custom Metadata object, there will be a visual marker near its name in the list so you won't miss what was changed.